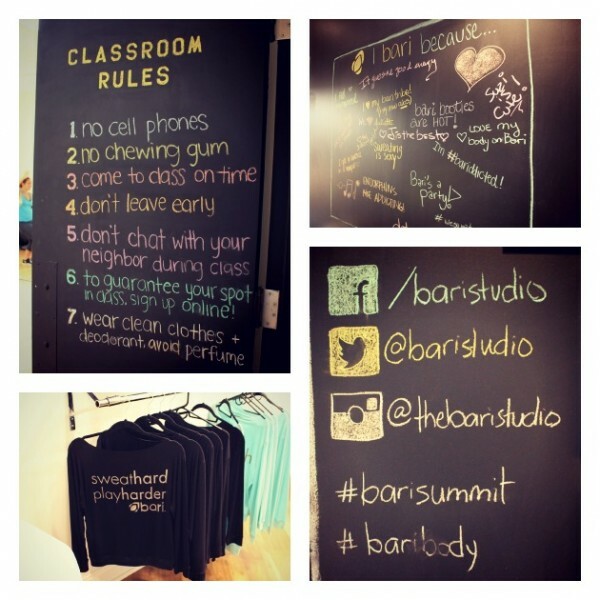 Sunday October 5th (1-3pm) Bari Studio in Summit is having their grand opening and ribbon cutting ceremony... complete with workout demos, complimentary juices & healthy food, and class giveaways. There were so many things about Bari that impressed me. I love their huge chalkboard wall. It was such a great way for clients to share their thoughts, keep track of their monthly competitions (21 workouts in 31 days! ), and even take a selfie! They have a lot of different options for class types (private/intro/groups) and different membership options and class packages to choose from. The instructors were really excited... and seemed quick to help out new students to make sure they were doing the exercises properly. I imaging Bari in Summit is going to do REALLY well. Tell us a little about Bari Studio. Named "NYC's Best Hybrid Workout" by New York Magazine and one of the "Best Places to Work Out in 2014" by Harper's Bazaar, bari is a cutting-edge approach to working out. Our hybrid method combines sensory dance cardio, trampoline cardio and muscle sculpting to produce visible results in record time. When did you start out and tell us more about Bari. I founded bari in 2011 when I decided to take my fitness routine into my own hands. A a former consultant, I juggled running, spinning, barre, yoga, and pilates all while traveling around the world for work. I felt that in order to achieve a well-balanced fitness plan (cardio, toning, and conditioning), I had to do multiple workouts; and even still, I wasn't seeing the results I wanted. I knew there had to be a way to a) have fun while you worked out, b) target every muscle in your body and c) get in your cardio and muscle sculpting in a one hour session. So I left my finance job and started developing bari. Describe the class and routines at the studio. What are the timings and is childcare available? bari has 3 main components: sensory dance cardio, trampoline cardi, and muscle sculpting. The prerequisite intro class, the barione, contains all 3 elements and breaks down each in a way digestible to new clients. We introduce you to new movements and new muscles, and get you comfortable with the props we use so you are ready to jump into your next group class. After the barione, you can choose from a number of class offerings that combine our elements in different ways so you can target and reach your goals. Our private training schedule caters entirely to our clients (i.e. private clients can book sessions whenever they want!). Our class schedule varies day to day, but class times range from 5:30 am to 8 pm and the schedule is constantly changing to cater to client request. We do not have childcare. Do you need to be physically fit or can anyone in any shape come join Bari? I truly believe the best way to stick to a workout or to start working out is to fall in love with the results that your workout produces, and bari truly delivers unparalleled results. So if you're looking for something to hook you, no matter your fitness level, bari will do that. I should say bari's workout is designed to push your limits, so most of our clients have high levels of fitness and come to us looking for something new that will kick-start results or bust them out of a plateau. That said, we welcome people of all ages and fitness levels as long as they're ready to work hard and sweat a lot. After coming to class for just a few weeks, you will feel stronger and more coordinated and better able to take on our high-intensity classes. We highly recommend our private training program to anyone who feels overwhelmed in the group setting. Even 3 privates will make you feel so much stronger and more confident and will truly arm you for any of our offerings.